This document is one of a series of tutorials to demonstrate the use of the Web Services tools in the Web Tools Platform Project using the WTP 1.5 drivers. 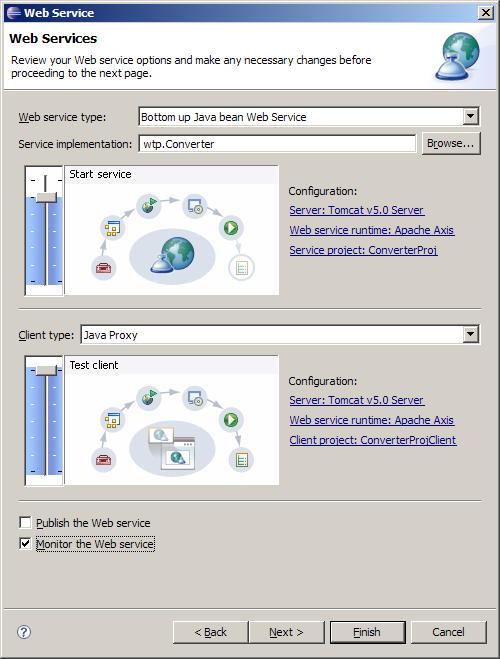 This tutorial shows how to create a simple Web service and Web service client from a Java class. The Java class in this scenario converts between the Celsius and Farenheit temperature scales. Create a dynamic Web project called ConverterProj . Import the wtp/Converter.java class into ConverterProj/src (be sure to preserve the package). Open File -> New -> Other... -> Web Services -> Web Service. Move the Service slider to the Start Service position . Move the Client slider to the Test Client position . Select Monitor the Web service . If you want to choose a server different from the one defaulted by the wizard, click the Server project link to select a server . 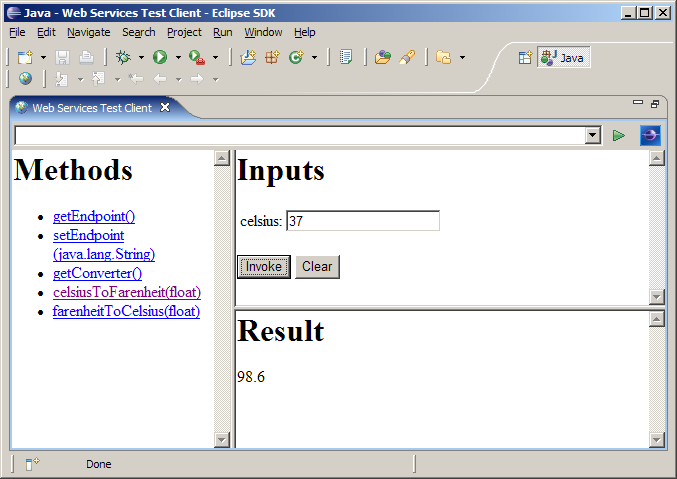 Under Methods , click on celsiusToFarenheit(float) . Under Inputs , enter 37 into the celsius entry field. Click on Invoke. In the Result view, you should get a response of 98.6. The Web Service wizard is orchestrating the end-to-end generation, assembly, deployment, installation and execution of the Web service, Web service client, and sample JSPs. In this scenario, we clicked Finish on page one. In effect, this is allowing the wizard to pick reasonable defaults according to the basic high-level choices made on the first page. If you repeat this scenario, but use the Next button to work through the wizard, you will learn more about the kinds of choices that are available and the kinds of defaults being assumed. 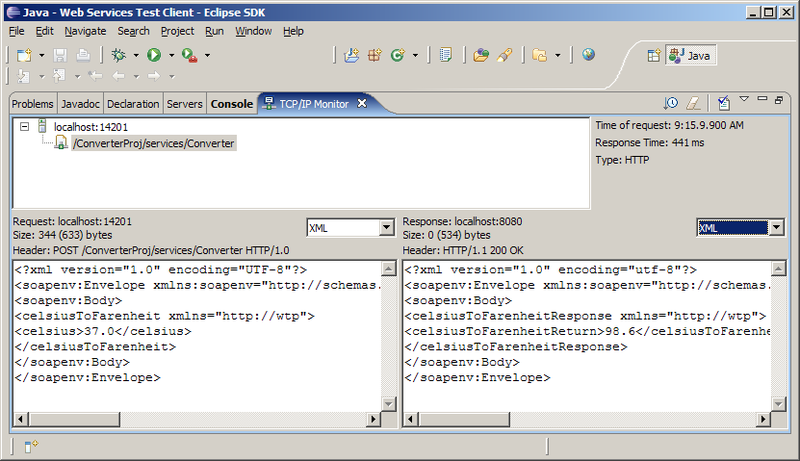 After completing this scenario, the WSDL for the Converter Web service can be found in ConverterProj/WebContent/wsdl/Converter.wsdl. You can double-click on the WSDL to open the WSDL graphical editor. 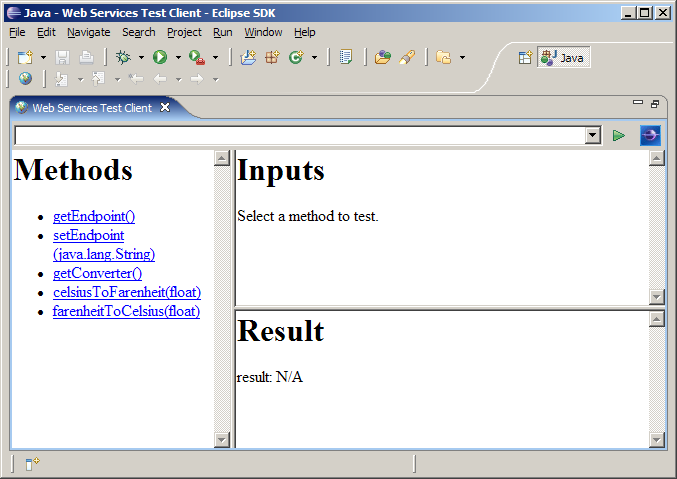 You can right-click on the WSDL and choose Web Services -> Test with Web Services Explorer to test the service. You can right-click on the WSDL and choose Web Services -> Publish WSDL file to publish the service to a public UDDI registry. You can click on the WSDL and choose New -> Other... -> Web Services -> Web Service Client to generate a Web service client. Note, however, that we have already witnessed the internal and visual features of the Web Service Client wizard since, in addition to being its own wizard, it is quite literally embedded within the larger Web Service wizard.